Imagine yourself awaking to the rush of the Blue River under your deck and enjoying breakfast on the terrace. Consider the pleasure of teaching your children or grandchildren the cunning habits of wily Mr. Trout and frying him in a pan or introducing them to the flight of the humming bird or the indescribable scent of evergreen in the air during a dramatic mountain, summer storm. These memorable experiences are available to you at our spectacular , 4000 square foot, log home surrounded by towering spruce trees and overlooking the Blue River and Peak 10 in Breckenridge, Colorado, an historic Victorian mining town. This three-story, custom home features massive hand-crafted logs and distinctive mountain decor. Pets are NOT allowed, No Smoking. We are on the free shuttle to all activities and only 1/2 mile from downtown and the lifts to world class skiing at the Breckenridge Ski Area. Most holidays and busy late summer may require a 7 night minimum. GAME ROOM WITH POOL TABLE, HOT TUB, STUNNING VIEWS, FISHING IN YOUR OWN RIVER RUNNING RIGHT BEHIND THE HOUSE, FREE SHUTTLE JUST 300 YARDS FROM THE HOUSE!! We invite you to share our comfortable home with its breathtaking views for your next family get-together or business retreat! You will LOVE Michael's Haven on the free shuttle to all activities and only 1/2 mile from down town and the lifts. There is a gas grill, chiminea and 8 man hot tub on the massive decks overhanging the rushing Blue River (a gold metal trout stream) and looking up to towering spruces and Peaks 8,9 and 10. Our home can sleep 20, therefore perfect for large family or work groups. 10 Mile Range at your back door! Garage and drive will accommodate 4 cars only. The onsite caretaker needs the left back parking space. Table seats 12 with 6 stools at bar. My family had a great time at Michael's Haven. So much room for our families to spread out. While it was close to main Street, most of us used the bus. I recommend this home for large groups. Very clean and very beautiful. Beautiful cabin with lots of room and a fantastic location easily within walking distance to the heart of town. Plan to book it again this summer and would absolutely recommend it to anyone. Our family has stayed several times @ Michael's Haven. We've got 3 grown kids (2 are married) and all 7 adults plus a baby stayed here last summer - which is when we like to go. It's a beautiful cabin - plenty of room and well maintained. It took us 5-10 minutes with the stroller to get to the restaurants on the south end of town. It is the perfect get-away for a family! 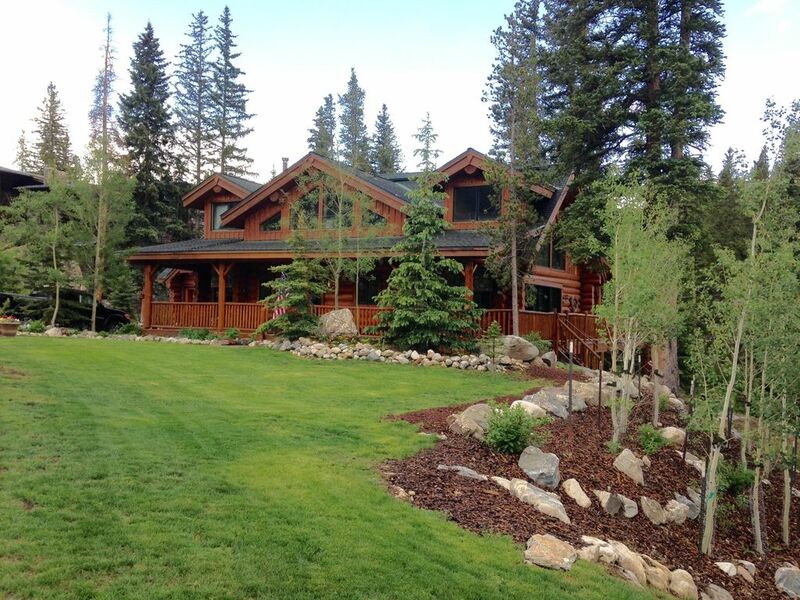 Our extended family returned once again to stay in this gorgeous log home. This was our sixth visit - we've been twice in the winter (ski season), twice in the fall and twice in the summer. I can't decide which season is our favorite! There is so much to do in each season. The Blue River runs right by the house with trout fishing at your back door. The shuttle to the ski slopes is a block away. The hot tub is marvelous in all seasons - it sits on a huge deck that surrounds the back of the house and you have full view of the beautiful ski slopes. There are 3 floors with bedrooms on each level so there's lots of privacy. The main floor is handicap accessible. The wrap-around deck is wonderful. The decor is amazing! The pool table was a hit with kids and adults. There is a caretaker on premises. We will keep returning every year to enjoy everything that this wonderful home, city, county has to offer. It's delightful - our family wholeheartedly recommends it!